Ole Miss rolls with Gotcha Bike, bringing high tech bike share to campus. 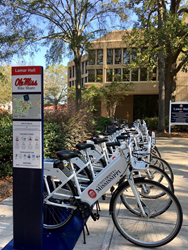 Gotcha Bike, a fast-growing bike share and technology company, has collaborated with Ole Miss to launch Oxford’s first eco-friendly bike share program. The program will start with 50 smart bikes with seven hub locations. The launch marks the 30th system the company has established in just two years. The Gotcha Bikes (http://www.gotchabike.com) are the nation’s smartest, thanks to Gotcha Bike’s partner, Social Bicycles, and its proprietary GPS technology that allows users to locate and access the bikes through a smartphone or computer. Charleston, SC-based Gotcha Bike’s unique technology interface allows administrators to assess bike usage, in real time. The domestically assembled bikes are also the most rugged in the industry, reducing maintenance costs and headaches. The new bike share’s app allows users to unlock bikes with ease, and tracks carbon dioxide emission reductions and keeps track of individual calorie use. Meanwhile, access is not smart phone-dependent, as is the case with other bike shares, meaning Gotcha’s system is accessible to community members who utilize computers in community centers or other places. “Easing access makes us a true community bike share,” said Flood. The bikes’ integrated technology and flashing safety lights are powered through a built-in solar panel and dynamo hub, giving riders real-time data from each bike ride, such as carbon dioxide emissions reduced, calories burned and money saved versus driving. Gotcha Bike currently operates share systems on 30 collegiate, residential and corporate campuses across the U.S. To date, more than 9,575 members have biked off 2,590,370 calories over 64,857 trips while concurrently reducing carbon dioxide emissions by 57,106 pounds (versus driving).